If your goal is to give the teems of weekend hikers flocking to the mountains a wide berth, I wholeheartedly recommend this hike. The hike starts near Otsuki Station in Yamanashi Prefecture around 90 minutes from downtown Tokyo. While relatively close to Tokyo the surrounding mountains feel more akin to remote wilderness than the city fringes. In a similar vain to last year’s hike to Shirayanomaru 白谷丸 the hike starts out from the Hamaiba mae bus stop ハマイバ前 a short bus ride from Otsuki Station (30 mins, 500 yen). Being the first day of the extended Golden Week holiday I had envisioned swarms of hikers, however there were only a couple of us lined up for the 7:00am bus. As far as road side walking goes the 10.8 kilometres amble up to Otoge 大峠 (1,560 m) is quite relaxing and thankfully the road doesn’t see much traffic. While I suggest bringing along adequate water for this 3 hour section, there is a water hole just before you head into the final series of switchbacks. Otoge makes a fine spot to enjoy an early lunch and includes a shelter to take refuge in bad weather along with a toilet and water hole. 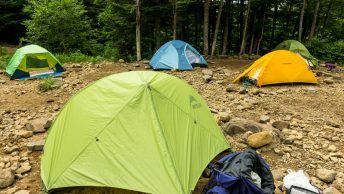 As you’re going to be wild camping at Mt. Gangaharasuri 雁ヶ腹摺山 (1,874 m) essential is to collect plenty of water as there isn’t any at the summit nor for the first few hours the following day. I filled up three large water bottles giving me a little under 6 litres. From Otoge you will climb a bit over 300 metres in elevation up to Mt. Gangaharasuri; on the first day the total gain is more than 1,100 metres. The first part is relatively steep and should take an hour or so of steady climbing to reach the summit. Carrying all this water comes in to its own when you can set up your tent during Golden Week with only a couple of other hikers doing the same thing. Without question if this site had a mountain hut and a nearby river it would be crowded as all buggery. The next morning the skyline had outdone itself with a well-defined Mt. Fuji beckoning at day break. It was patently clear why the outlook from this mountain was chosen to appear on the old 500 yen note – it’s quite simply sublime. The first point of call of the morning is paying a visit to Mt. 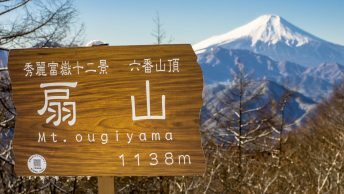 Ubakoyama 姥子山 (1,503 m) look for the signpost at the campsite. Before hitting the road, you will pass via Shirakabadaira 白樺平 which gives you the option of bypassing Mt. Ubakoyama. If the weather is agreeable I would recommend this side trip as the summit has excellent 360-degree views. After hitting the road, the best bet is to leave your pack at the base of the stairs which allows you to make light work of the mountain’s west and east peaks. After returning to the road and picking up your backpack, turn left for 300 metres and look for a signpost for Kaneyamatoge 金山峠. It will take around 40 minutes to reach a vehicular road and river where you can replenish your water supplies if need be. Go down this road for around 10 minutes before veering off to the right and up to Kaneyamatoge. Basically, you have three options for getting off the ridgeline. First is to head down directly from Kaneyamatoge, which on brief inspection looked to be brutally steep. The second option is another trail just before Onuta 大垈山 which again appears to be quite steep according to the map contours. I decided on the slightly longer travel via Semeban セーメーバン. This route was a little more measured in steepness, though being lesser used meant some sections of the trail were not as well defined. As a point of reference, I didn’t pass any hikers at all on the second day. The trail begins to steepen as it approaches Sakurazawa サクラ沢峠 and the final section down to the road is a tad hairy in spots as it forces you to navigate a precipitously path. For this last bit, all I can really advise is to take it slow and steady, watch your footwork and keep your centre of gravity firmly planted towards the embankment. From the road, it’s an easy 25-minute walk back to the bus stop at Osonoto 遅能戸 where you can pick up one of three weekend buses back Otsuki Station (17 mins, 290 yen). Lovely pictures of a lovely area David. Not much spring colour as yet. How big was the zoom lens for the Fuji offerings? Thank you, Stewart, and you’re right it’s a really beautiful spot worth paying a visit. Not much greenery above 1,000 metres at the moment but give it a couple more weeks and most of the lushness will have returned. The zoom is a Sigma 17-50mm F2.8, my workhorse lens I carry with me a lot of the time. 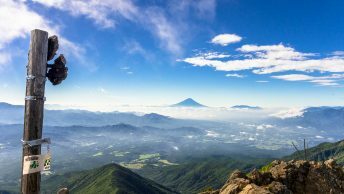 Many thanks for introducing this mountain – it’s good to be able to compare your excellent title photo with the elegant engraving of Mt Fuji on the old 500 yen note. One day, I hope to see this view for myself. The mountain’s name is another attraction – a peak that the migrating geese brush with their bellies as they fly past, if I read that aright… Most charming. Given you can visit comparatively easily from Tokyo made it an obvious choice to hike over golden week. As you mentioned, another purpose was with any luck, capture a half decent pic from the summit and match it to the 500 yen note engraving. Didn’t know about the migrating geese bit and it must be quite a spectacle to watch them pass overhead. Really appreciate the work you’re doing!